BOSTON (AP) — Olympic gymnast Aly Raisman won gold in the individual floor exercise in London on Tuesday, and her hometown of Needham, Mass. couldn't be more proud. BOSTON (AP) — Olympic gymnast Aly Raisman won gold in the individual floor exercise in London on Tuesday, and her hometown of Needham, Mass. couldn’t be more proud. The U.S. captain also took home the team gold medal last week and a bronze Tuesday for her individual balance beam routine, making her the most decorated gymnast on the U.S. team. The whiteboard sign outside Taylor’s Accents Gifts in Needham has displayed different congratulatory messages to Raisman throughout the past two weeks, calling her “Needham’s golden girl” after her floor routine in the team competition capped off the Americans’ gold-winning performance. “Maybe we should do ‘Needham’s double golden girl,'” store owner Jack McQuillan said Tuesday. “We’re so excited for her and her family,” McQuillan said. 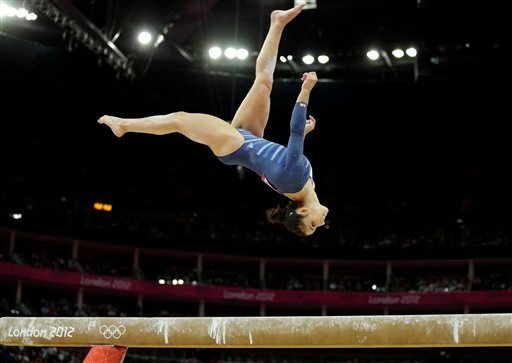 Raisman won gold about an hour after snagging bronze on balance beam. She originally placed fourth in beam, but her coach appealed the difficulty component of her 14.966 score. Judges raised her score to 15.066, tying her with Romania’s Catalina Ponor, but Raisman’s higher execution score earned her the bronze. Jerry Wasserman, chairman of Needham’s Board of Selectmen, had yet to hear of Raisman’s gold- and bronze-winning routines before The Associated Press contacted him. “Obviously we are all extremely proud of her. 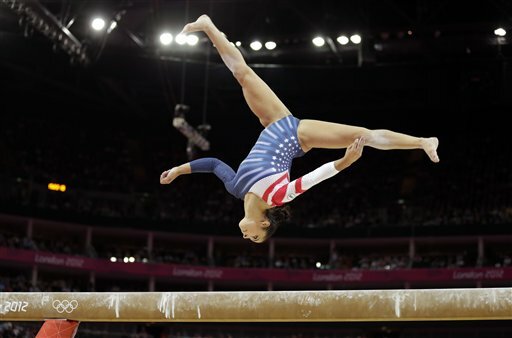 I’m not at all surprised,” he said, citing Raisman’s hard work and preparation. The gold medalist trains at Brestyan’s American Gymnastics Club in Burlington, Mass. She graduated from Needham High School but completed her senior year online to devote her time to training. The town will host a homecoming event for Raisman but won’t determine when until after speaking with Raisman and her family, Wasserman said.